I was given a better room the next day at no extra cost. Nothing. Maybe the fact it was warm inside, just that. Familienunternehmen italienischer Herkunft, super nettes Personal, Zimmer gut, viel Platz, geräumiges Bad, immer sauber. Frühstück ausreichend, neben an gab es einen kleinen Italiener der zum Hotel gehörte, passt. Beim Frühstück war ich der einzige Gast, trotzdem würde des gesamte Buffet aufgedeckt. Das war sehr nett. Das Restaurant absolut fantastisch, frühstück in ordnung,zimmer sauber.Schöner grosser Fernseher. Das Personal war freundlich. Leider kam ich nicht dazu, im nebenan gelegenen Restaurant zu essen, Bekannte meinten, es war sehr gut. Das Frühstück war in Ordnung. 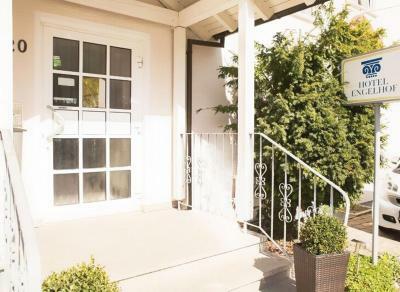 Engelhof This rating is a reflection of how the property compares to the industry standard when it comes to price, facilities and services available. It's based on a self-evaluation by the property. Use this rating to help choose your stay! This hotel in Weilheim town center offers free Wi-Fi, free parking and a cellar bar. It is a 5-minute walk from the historic center and busses. 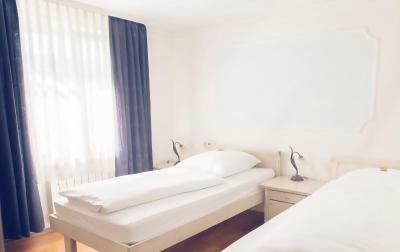 Hotel Engelhof provides individually furnished rooms with a TV and private bathroom. Some rooms include a special hydro massage shower with steam function. A breakfast buffet is provided at the Engelhof. Many restaurants and cafés can be reached on foot within 5 minutes. Guests can enjoy hiking or cycling up the adjacent Limburg Mountain. The A8 motorway is 1.9 mi away, and Göppingen is 9.9 mi away. 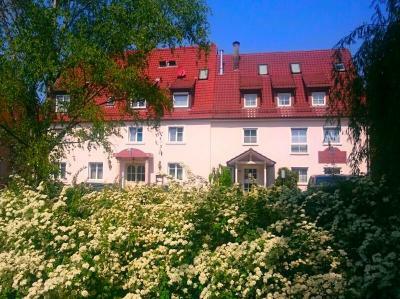 When would you like to stay at Engelhof? House Rules Engelhof takes special requests – add in the next step! Engelhof accepts these cards and reserves the right to temporarily hold an amount prior to arrival. My first room was unheated when I arrived and either TV nor Internet worked. Although the bathroom is fair sized the shower cubicle is tiny. Only 30 minutes to Stuttgart airport. Small room, poorly fitted-out. Noise-from ventilation fan? The lady at the reception said in a very rude manner that I haven’t paid, when I showed her the booking confirmation that was paid and the movement on my pay pal, she demanded me to send it to her. She could have said exactly the same thing and asked for help if she couldn’t find the information but in a nice manner. I have received 3 phone calls from them after I left and I thought it was because of my charger, as I left my iPhone 7 charger in the room. I remember exactly where, on the bed table on the left side, she said no, I haven’t and that she was calling because of a breakfast that we haven’t evento take. So she wanted me to pay her 10€. I will not pay for anything I haven’t eat. Also, she was rude to my baby girl. I would never come back here. I have left his hotel very sad and have shared the experience with my local business partners. Now the lady does not stop calling my number. The lady and a gentleman even argue with escriture in front of us... we do understand Italian! It was a very weird and poor experience.